History is defined by people who stood up against the odds. Not just the people who rose up in the face of adversity, but those who decided to swim against the current in order to stay true to an unwavering set of values. Chris Johnson, the pharmacist who began MedSavers Pharmacy, is one of those defining individuals. a stepping stone for me, a good salaried position until the next opportunity came along." While many of the population spent downtime watching television, Chris read insurance contracts to learn more about how pharmacies were being reimbursed for prescription medication. Sure enough, Chris figured out very quickly that insurance companies determine what uninsured patients pay for prescriptions, and it bothered him to his very core. Why would an insurance company have anything to do with an uninsured patient and the cost of their drug? Well, in 1995, he wasn't sure what to do about it, but he knew it was utterly wrong. He worked at a variety of retail and independent pharmacies, and by 1999, he had worked in over 80 pharmacies across 10 different practice settings, from retail, to hospital, to long-term-care, to research, and even psychiatry. He found one common theme in every pharmacy, and it was these contracts with the insurance companies. By the time he ended up in the oncology world which is vastly more expensive, it only magnified everything he'd witnessed during the previous few years. The difference between the purchase prices and the insurance rates for necessary medication was grotesque, only exacerbated by the looming threat of fines if the pharmacies didn't charge the uninsured patients the inflated price. Chris couldn't take it anymore-he knew the crux of the problem was the insurance companies. At that time, Chris could have easily realized how flawed the system has grown and swallowed his personal resistance like most people would have done. But that's just it-Chris wasn't ready to accept that there was nothing he could do. Nothing great can be built by people who accept their limits. So Chris began to work on a solution. "Most retail pharmacies cover around 90% of the patients that use insurance," Chris explained. "That means 10%-15% of patients out there are not using insurance." He spent a whole year examining every angle of his idea looking for downsides. No matter which way he looked at it, he knew it was the right step and pulled the trigger. and pass on savings to the customers. He could sell a drug with a wholesale price of $10-$12 for $20, making it affordable while also making a profit. "We'd still keep our lights on, we'd still keep our employees paid, and then somebody that doesn't have insurance can afford it. I don't have an insurance company breathing down my back threatening to hit us with charge-backs if we don't raise the prices to the reimbursed cost." MedSavers is designed to offer affordable options to those with little or no insurance, and serve as a resource for the community. After twelve years, it has done just that. Chris and his talented team have helped countless people get prescriptions filled that they might not have otherwise been able to afford. One of the biggest challenges that MedSavers faced in the beginning was that people couldn't believe the prices. The discrepancy between the cost and what other pharmacies were charging were just too massive for early customers to accept. "I can't tell you how many people called to ask where we got our meds from," Chris recalls. "They'd say they just didn't understand how the same drugs from the same warehouse in Conroe, Texas that cost $400 at Randall's, Target, or CVS, could cost $20 here. Thankfully, we've become established in our community so patients, physicians, and clinics know who we are and seek us out." It's estimated that 80% of a pharmacist's time is spent on the telephone dealing with insurance problems. All of the sudden, that disappeared for Chris. That's 80% more time to be a resource for doctors, help patients, and form relationships with the community. "If a doctor wants to call and ask questions about prescription costs, we can sit there on the phone and talk about it right then," Chris says. "That's what we do all of the time. It's a complete shift of the paradigm for how a doctor/pharmacist relationship can develop, at the benefit of the community." Of course, our story isn't all roses. There were many challenges along the way and many mistakes made. One massive change came in the form of the ACA. The Affordable Care Act's major provisions came into effect in 2014, requiring that the population become insured. "We had this mass exodus transferring out, which dropped about 20% overnight and is huge in terms of business projections," says Chris. "But before long, people began to become more savvy about the penalty since, at the time, it was the cost of about one month's worth of premiums. Many of my paycheck-to-paycheck patient population were trying to make ends meet, and still needed our services to help." By year four, growth was continuing again, and now they're even expanding their services. MedSavers has added compounding (tailoring each medication for the patients' needs) to their available services, as well as mail orders to surrounding states. And as MedSavers expands and diversifies, they are only beginning to grow into their potential. At this point, their marketing has become primarily word-of-mouth. And Austin has been the perfect environment to cultivate this business. "Austin is the weird place. Keep Austin Weird. Everybody is kind of looking at things a little bit differently in this town. I think there's a different mindset, and when they see something that's a little out of the box, it's not scary." And sure enough, it's disrupted our city. Not only are people interested, they love it, and they embrace it. Another learning opportunity for Chris was shifting his mindset for increasing the size of his team. "I owe a lot to my wife for helping me see that instead of losing money by hiring pharmacists to take over some of my workload, I was gaining time at home with my family, spending more time doing other things I wanted to do, working on other prospective ideas for the future of MedSavers. Once I was able to make that shift, it became a no-brainer to have relief enough to preserve the dynamic of our unique atmosphere." Of course, Chris knows he couldn't have done it alone. "I have a great staff and they've all bought into what we're doing. I feel comfortable pulling more and more of my hours away knowing that they share the vision and can communicate to our patrons the way I would. It's opened me up to look into other opportunities for the pharmacy's growth." MedSavers isn't just a great idea. It is a place of compassion for those whom the system has failed. Chris was able to create possibility within an industry riddle with problems. The story of MedSaver Pharmacy is one that should make us all stop and consider about how we, too, can swim against the current and define history. 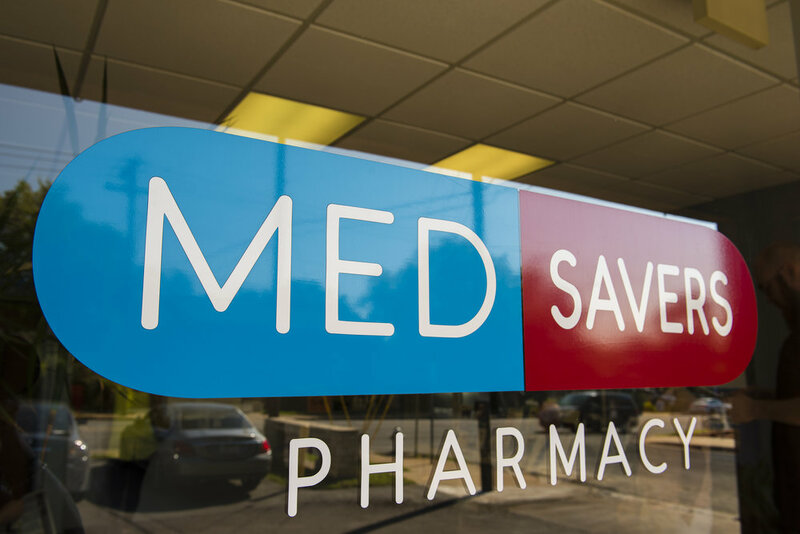 To learn more about how you can save on your prescriptions, contact MedSavers Pharmacy at 512-465-9292, or check it out online at www.medsaverspharmacy.com.